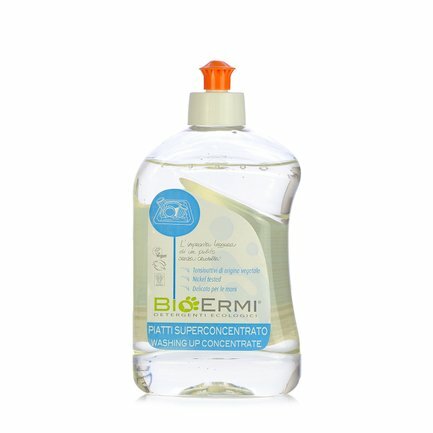 To wash dishes and cutlery without using harsh products which are unkind to materials and skin alike, opt for this environmentally-friendly extra-concentrated liquid from BioErmi. In addition to eliminating oily and greasy residues perfectly, it also has an appealing scent thanks to the lemon essential oil it contains. The exclusive use of coconut and corn derived surfactants guarantee its effectiveness, respecting nature while protecting your hands. Carefully sourced raw materials and organically farmed ingredients, even when it comes to household cleaning? It can be done, with the BioErmi products Eataly has selected for you. Try them out: you will discover some truly effective detergents, which present an excellent alternative to traditional cleaning products. In fact, only plant-origin surfactants are used to make these products, and the end result is approved by the Lega Anti Vivisezione (LAV; the Italian Anti-Vivisection League). Give them a try: your house will be clean and naturally scented!